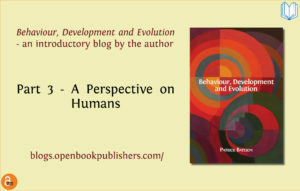 My central academic interests have been with the development and evolution of behaviour and I have long been concerned with the relevance of my work to humans. The notion of genetic determination, which was so firmly embedded in evolutionary theory, has seriously interfered with attempts to understand the dynamics of behavioural development and its role in evolution. If anything has been learned in recent years, it is that what an individual does in its life is conditional and depends on the reciprocal character of the transactions with the world about it. This knowledge also points to ways in which its own behaviour can provide the variation that influences the subsequent course of evolution. When developmental issues are joined with questions about evolution, it becomes easier to perceive how an organism’s behaviour can initiate and shape evolutionary change. These changes in biological thinking affect the relations between the natural and the social sciences. The biggest block to bringing the biological and social sciences together was the presumption that Darwinian evolution implied genetic determinism. This block has now been removed by advances in biological thought and by a greatly improved understanding of development. The origins of much violence in human society involve many inherited dispositions or adverse experiences in early life. The consequences of these developmental abnormalities are expressed as harmful or psychopathic behaviour already, before the age of three, and may persist throughout life. However, in a humane society much can be done to help such troubled people by identifying them early on, giving their parents extra support, treating them with sensitivity and not punishing them for bad behaviour. They need not be treated as irredeemable and effectively given a life sentence. In many social contexts a person might weigh up consciously or unconsciously the benefits to themselves of behaving in a particular way. The benefits of cooperation might include avoiding disapproval or punishment by other people. These dispositions can conflict with powerful impulses to act in ways that benefit the social group, the tribe, or some larger assemblage without any direct benefits to the individual. Humans may cooperate with individuals they regard as belonging to their own social group and express fear or hate of those individuals they regard as being different or foreign. They may be influenced by their desire for leadership and strongly disapprove of anybody who does not conform with their views. None of these impulses are invariant. They can be, and often are, changed by experience. Conformism and the expression of fear and hate can be inhibited, or modified either by social norms or by becoming aware of the damaging consequences of allowing full reign to such impulses. The impact of bringing together evidence from different areas of knowledge is on how humans change institutional rule that have become dysfunctional or design public health measures when mismatches occur between themselves and their environments. It affects how humans think about themselves and their own capacity for change. The biological approach to human psychology does not imply that individuals do not have free choices. Through their decisions individuals clearly do make a big difference to what happens in their own lives and the lives of others.